Shouldn’t the Robots Have Eaten All the Jobs at Amazon By Now? How can this be? Shouldn’t the robots have eaten all those jobs by now? The reality is that we suffer from a serious poverty of imagination when it comes to thinking about the future, and future job opportunities in particular. 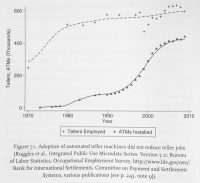 “One thing automation alarmists sometimes miss is that the simplistic ‘machines steal jobs’ story tells an incomplete tale,” observes James Pethokoukis of the American Enterprise Institute. “How machines can complement what humans do and create increased demand should not be overlooked when evaluating the rise of the robots. Yet it seems like it often is,” he notes. Bank tellers are the paradigmatic example. With the rise of ATMs a few decades ago, many thought the days of bank tellers were numbered. 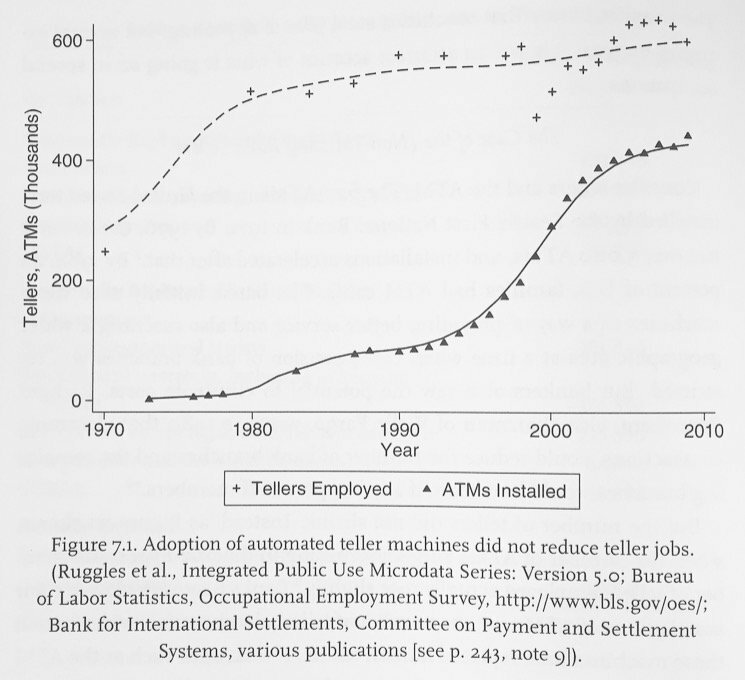 But research by economist James Bessen of Boston University shows that we have more bank tellers today than we did 40 years ago. (See chart below). How’s that? Because once the ATMs could handle the menial tasks of counting and distributing money, the tellers were freed up to do other things. Of course, in the short-run, that process of creative destruction isn’t always pretty. In fact, it can be gut-wrenching for some professions and workers. But the long arc of history, this is how progress happens. Previous post: Are “Permissionless Innovation” and “Responsible Innovation” Compatible?